La Lanterna is easy to miss, on bustling Hope Street. And that would be a real shame, because those in the know have been in love with this hearty helping of Italy for years. Step downstairs into a haven of peace and quiet, and enjoy a fab Italian lunch or dinner that is prepared with great pride, and complete attention to detail. Super food at sensible prices is the name of the game. No wonder it carries on year after year, quietly serving up tastes of Italy to happy, well fed locals. Great news! Finding this page means you can now join our VIP list for La Lanterna. Grab your very own web page all about La Lanterna. 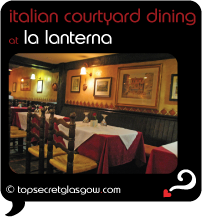 Do you have a special story about La Lanterna? A funny experience? A grand occasion? A funky photo? A personal tip? A top secret? public Glasgow Central Station (NCP) in the hood!